I was just at a local shop that sells Vineyard Vines clothing. While there, I decided it was time to list my Vineyard Vines fall picks! First - the headband. I don't wear them much, though I should. They really are the preppy accessory of choice (in fact, Hopsy and Muffy Martini discussed headbands recently on WASP Wednesday.) 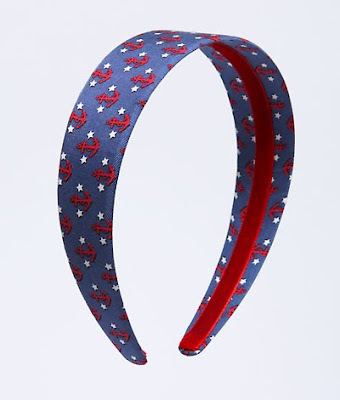 Of course, I thought of both Headbands & Handbags and Kate over at Nautical By Nature when I saw this. They have it in red too! Fall is always too drab for me (everyone is my office wears gray and black....bleh!). Who said black, brown and olive green have to be the ONLY colors one wears in fall? I love patchwork and this shirt is just too cute! I love the nautical look though I'm not crazy about sideways stripes. The gathered middle in this sweater make it desirable, in my opinion. Plus again, due to my geographical location, the short sleeved sweater works for me. I am a sucker for cardigans and button front sweaters. I work in an office where it is freezing and then walk outside to blazing hot weather, so cardigans are a absolute necessity year-round. Plus, they're just cute! I LOVE this sweater, the buttons, the collar, the pockets, the color which goes with anything). What about this patchwork skirt? Perfect for fall, but like I said, it has that extra punch of color to keep the drabbiness far, far away. Love the boots too! I agree - I love to use a lot of colour in the fall...specially pink! Very cute picks! I am in love with that shirtdress! AGREED!!! Love your choices...I really NEED that dress. Is your middle initial L? Random, I know, but I need to know. :) Thanks for the card...you're the best! I think our closets must be very similar, those are some of my favorite fall picks as well! And I have that head band, in red, school color! Thanks for the shoutout! Definitely my favorite picks for Fall!